This is a story called Mabel Takes a Paddle. It’s about a dog that goes on a kayaking adventure on Orange Lake in Maine. It’s Mabel’s first time kayaking and she wears a lifejacket. I’ve never seen a dog wearing a lifejacket, but she does! Mabel is amazed at how many animals she sees from the kayak, like a bear, a moose, an eagle, deer, ducks, a turtle, and a lot of fish and dragonflies. Most of the animals are frightened of her, but she doesn’t know why. She tries very hard to keep quiet, but she can’t help barking at every animal she sees. She wants to be friends with them, but she can’t because a dog and a duck are no match for each other. Mabel’s family has a talkative parrot named Bert. He sits on Mabel’s master’s shoulder while she’s writing, and he likes to ask everyone, “Whatcha doin?” When you’re finished reading the story it seems like you’re finished with the book, but you’re really not because there’s a whole glossary about all the animals that Mabel sees. The illustrations by Susan Spellman are very pleasing to the eye. She uses very pretty watercolors and she really gets the texture of the water and the trees. Mabel is a real dog and she lives on a pony farm in New Hampshire. She visits schools all over New England when she’s not kayaking or at home on the farm. She likes to dig holes and roll in the mud with her buddies Blue and Charlie. If you like dogs, animals or kayaking, you should read this book because it’s a really great story. Thank you. 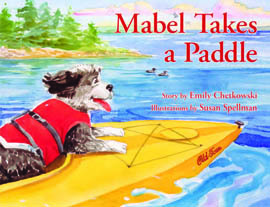 Editor’s note: Mabel Takes a Paddle is the latest in a series of true adventures that also includes Mabel Takes the Ferry and Mabel Takes a Sail. Ask your favorite independent bookseller to order them. For more information, visit emilychetkowski.com and suespellmanstudio.com.